Hello and welcome to my Hankook DynaPro AT-M RF10 tire review. In recent years, or more like in the recent decade, SUVs and crossovers have become the most popular style of vehicles available on the market. People simply love the image an SUV or crossover brings with it, but also the interior space and better visibility. To be perfectly honest, not a lot of people buy SUVs for their off-road capabilities, but that’s a discussion for another day. If you still fall into that category, or in other words want to venture off-road with your SUV, then you’ll need a good all-terrain tire. This type of tire should provide very good traction in most off-road driving scenarios, as well as good handling on the road. For most SUV owners, this is the only tire they would ever need, but if you’re very serious into off-road driving, then you may need a proper off-road tire, or if you don’t drive off-road, you may need highway tire. 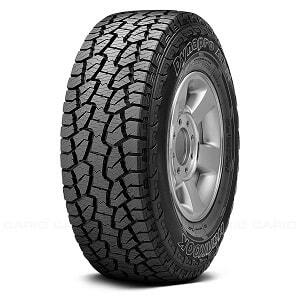 Today we’re going to discuss one popular all-terrain tire, the Hankook DynaPro AT-M RF10. Hankook is not the first company that comes to mind when talking about all-terrain tires, but they think that this tire is a big hit and that its performance is one of the best out there. They make some pretty bold claims about the Hankook DynaPro AT-M RF10 and it will be interesting to see if they will deliver on that promise. You bet that I’ll put that to the test in the following Hankook DynaPro AT-M RF10 review, but first let’s take a look at what Hankook says about it. Hankook has a lot of good words to say about their tire, and a lot of promises as well. They start by saying that the Hankook DynaPro AT-M RF10 is made for aggressive all-terrain driving, which certainly sounds good to me. According to them, it is best-suited to light-truck, van and sport-utility vehicles. It features innovative tread and sidewall design, with white lettering that most off-road fans absolutely love. Let’s go into more details. The wraparound tread gives rugged look and increases resistance to puncture, which is very important in off-road driving. For extended tread life, the tire features deep two-step sipes, while tiered side grooves help for more predictable cornering. Interestingly, the Hankook DynaPro AT-M has 7-8% wider footprint that competitors in the all-terrain class, which additionally improves grip and traction. For better off-road performance, the DynaPro AT-M is equipped with stone ejectors in the center and shoulder grooves, nylon-reinforced belts and reinforced under-tread gauge for more durable construction, and wraparound tread for more rugged puncture resistance. All-terrain must be strong – they will not only sustain heavy off-road driving but a lot of towing and hauling as well. I am happy to confirm that the Hankook DynaPro AT-M RF10 is very durable and it will last for a long time. It also repels stones with great ease, which is another plus point for the tire. When compared to the best all-terrain out there, it is comparable in this category, especially given the lower price. Thanks to the 7-8% wider footprint, the Hankook DynaPro AT-M RF10 provides the driver with very good handling on the road. There may be some better tires in this category, but this Hankook is certainly up there with the best. I was especially impressed with the high-speed stability of this tire – fast highway driving shouldn’t pose a problem. Despite being an all-terrain tire that was designed to be equally good on the road, the Hankook DynaPro AT-M RF10 is very good for off-road driving. It can successfully tackle almost any terrain, including mud. For most people, the DynaPro AT-M negates the need for a real off-road tire – it provides excellent traction and isn’t ashamed of more serious terrains either. All-terrain tires often struggle in the wet, but not the Hankook DynaPro AT-M RF10. In the rain it provides the driver with very good traction – the back tires almost never struggled for grip while accelerating hard, and the braking distances were very short. The tire also resists hydroplaning very successfully, which helps tremendously when driving faster in the rain. Despite having aggressive tread design and very deep grooves, the Hankook DynaPro AT-M RF10 is not at its best in winter conditions. Sure, it will be better than most highway tires in the snow, but the rubber is simply not pliable enough for good traction in below-freezing temperatures, and it especially suffers when braking. There are all-terrain tires that work in the snow – look at least for the 3PMSF symbol on the tire so you can be safe when driving in the snow. Or buy proper winter tires if it snows often in your area. All-terrain tires are known to be notoriously bad when comfort and noise are mentioned. The Hankook DynaPro AT-M RF10 is certainly not very quiet when compared to highway tires, but no one expects that from it. When compared to other all-terrain tires, I must say that I’m impressed with the quietness at lower and higher speeds. This may not sound like very important for truck and SUV drivers, but I think that better comfort after a long off-road driving session is the best thing you can have. Well, the Hankook DynaPro AT-M would have been the perfect tire for long-distance traveling if it weren’t for the worse ride quality. The best premium all-terrain will provide you with better ride quality then the DynaPro AT-M – Hankook’s tire is slightly jumpier on roads with a lot of potholes. This is especially pronounced in pickup trucks and not so much in passenger SUVs. All in all, the Hankook DynaPro AT-M RF10 is a great all-terrain tire, despite the few shortcomings, like the worse ride quality than its rivals and below-par snow performance. The good things are prevalent – excellent off-road traction, very good on-road traction in dry and wet conditions, low noise on the road, and long-lasting tread life. When you put the price into the equation, the DynaPro AT-M is one of the best buys in its class.